The United States Conference of Catholic Bishops has required all Dioceses/Eparchies to have in place Safe Environment Programs for the protection of children and young people. All individuals over the age of 18 who will be working with and ministering to young people under the age of 18 are required to complete all 3 components prior to working with young people. Below you will find instructions for completing all components. Thank you for taking the time to help keep our children safe! Background check results can take up to a week to receive once submitted. Due to this, please complete and submit this form first and then complete the other two parts. After the background check is run the parish will be informed if the person is allowed to work with children. The parish does not receive the details of the background check, we are only given a yes or no, and everything is kept confidential. If you have concerns please contact the Director of Faith Formation. Please download, print, and fill out the following form. Once completed, please return the form to the parish office in a sealed envelope addressed to Mara Vogel. 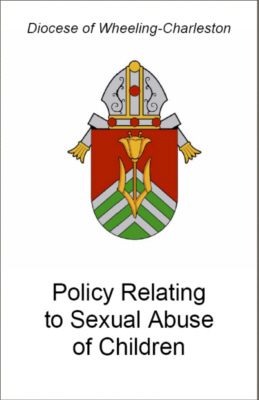 Please take time to make yourself familiar with the Diocesan Policy Relating to Sexual Abuse of Children. This can be found on the webpage for the Diocese of Wheeling-Charleston by clicking on the picture below. If you would like a hard copy of the policy please contact the parish office. Once you have made yourself familiar with the policy, please fill out the form below and return it to the parish office. The workshop, Protecting God’s Children for Adults by Virtus®, helps you learn about how to see signs of abuse, what to do should you suspect an issue, how to help keep yourself and children safe, and much more. Some of these workshops are done in person, but most people complete the course online. Below, you will find instructions for registering and completing the course. Should you have trouble or questions you may contact the parish, or Sharon Goudy, the coordinator of the Office of Safe Environment for the diocese. Once you have finished the course you will need to provide documentation that it has been completed. This may be done by printing and mailing or emailing the certificate that is provided upon completion.